This was one of the most intriguing things that we had listed as a requirement to pass the Kundalini Yoga Teacher Training for me. I have studied several streams of Tantra off and on over the years, and I had not hear of White Tantra before, nor Red or Black. White Tantric yoga is said to enable you to enjoy your life by releasing all the subconscious stuff that affect our conscious minds negatively. It is said to be a one day workshop to release subconscious childhood traumas and fears so we can live according to our conscious mind instead of the subconscious mind. I didn’t know what to expect nor did I research it before the class. Sometimes its better to just jump in! I had heard coming up to the class stories of the torturous experience of sitting for a full day in meditation and all the stuff that came up. I had heard that it was a challenging experience, but as far as I was concerned the day I showed up for White Tantra that was all other people’s stuff, and their experiences nothing else. It is quite a different experience walking into a room full of 170 yogis and yoginis of different ages, nationalities and life paths in white. 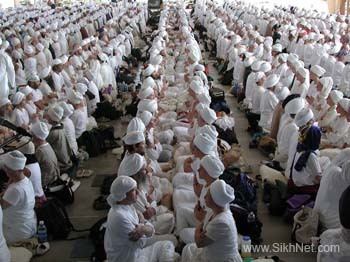 There was not one person missing their turban or their white pants. Yoga mats and sheepskins covered the green linolium floors of the community center the facilitators had rented for the day. I found a spot, and found my “man” for the day, one of my best friends also in Kundalini Yoga Teacher Training. She sat facing me, to the West, as all the other men and women acting as the masculine did, and I faced her. Then we began. For the morning we did three. The second meditation was one that I found challenging. I felt shifts of energy moving through my body, flashes of heat, build ups of pain, my legs were hurting and my upper back too. I wanted to shift and move around. I wanted to break the meditation. But I didn’t. I could feel my friends energy lifting me up, lifting me through, holding me energetically in the space of the meditation. I could feel her support throughout the entire thirty two minutes in a way I’ve never felt support before. By lunch time all of us were happy for the break. It felt like a fairly easy day to me for between each meditation there was a significant break of around twenty minutes. We really did get lucky. But that didn’t mean that we didn’t feel the effects or the changes of the meditations that we did. In the second half it was me supporting my friend through some very challenging moments for her. The meditations did not get more challenging per se but easier. They seemed more challenging as my my body continued to increase in its aching and the desire grew inside of me to just stretch and move. My mind tempted me – a continual refocus to the present moment. After the class I felt extremely tired. I slept twelve hours that night, and the next day I felt like a zombie and slept ten hours. I thought I was oversleeping but I’m just sleeping through my alarms. Its strange. I’ve also felt since the day of meditation a little low on myself. Low as in there is a deep unhappiness within me coming to the surface. Life is moving, flowing. I am learning and there are many things that I am thanking the Universe for daily. Yet there’s a feeling of lowness that I am having trouble getting out of except in brief moments of ecstasy. I’m not sure what do about it, or if there is anything to do, or if this is the way that I am releasing the subconscious stuff. We were told that it takes forty days for the work of the day to integrate within our systems. Over the next forty days it is essential to keep our frequency high and its recommended that we start a forty day meditation. I started last week a one hundred and twenty day meditation for prosperity so I’m going to keep doing this one. Maybe all I need is a good cry. I have to find tactics that will make me cry because I’ve observed that I don’t just cry at times I need to. Instead I move around the world in a strange half here half there bubble. Ideas? There are two boys that are always getting into trouble in the neighborhood, breaking windows, getting things dirty and all that stuff. Finally the adults approach a great elder of theirs and asks him to talk to the boys. The adults go okay, okay, and sure enough the boys get in trouble. They send one of the boys to the elder. The little boy looks at him wide-eyed. “Where’s God?”The elder asks again. The little boy bolts out of the elders home, runs to his home, runs all the way upstairs and hides in the closet.